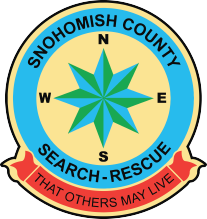 Saving lives in remote places… Snohomish County Volunteer Search and Rescue can use your help! For 50 years, they have answered when called and gone out on missions supported by volunteers with thousands of hours of training and specialties. The operations come at a price, though, and the nonprofit Snohomish County Volunteer Search And Rescue (SCVSAR) is looking to keep the outfit going through soliciting donations, grants and time. This is where the SCVSAR food truck comes in, although the 31-year-old GMC Value Van, which is a former SWAT vehicle, is on its last days of missions. “We are currently faced with — ‘how are going to replace this food truck?’ It’s still running, but it’s failing and it is a critical part of our missions because it helps sustain our volunteers,” said Bill Buck, board vice-president and volunteer. The food truck goes out on nearly every mission. It was a vital part of the Oso Mudslide response because it spent nearly 30 days out with the volunteers. To learn more about what we do and how you can help, visit the full Snohomish County Tribune article HERE or, visit our donation page HERE to lend your support now!